French journalist and author; born at Paris 1835; died at Neuilly 1896. Under various pseudonyms, among which were "Arthur Clary," "Antoine Cerlier," and "Fulgence Ridal," he contributed to numerous papers. He was an admirer of Balzac and Victor Hugo, an ardent socialist, and well versed in matters concerning the stage. 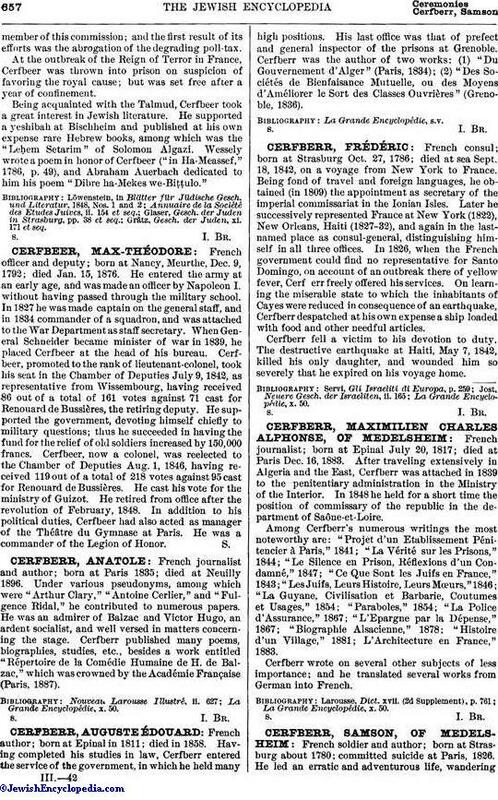 Cerfberr published many poems, biographies, studies, etc., besides a work entitled "Répertoire de la Comédie Humaine de H. de Balzac," which was crowned by the Académie Française (Paris, 1887).